The world is fascinated by GDP and its growth. Countries and administrations are frequently judged by how much they have of it. A recent IMF study concluded that China had already overtaken US, when adjusted for purchasing power parity (PPP), many years earlier than expected. 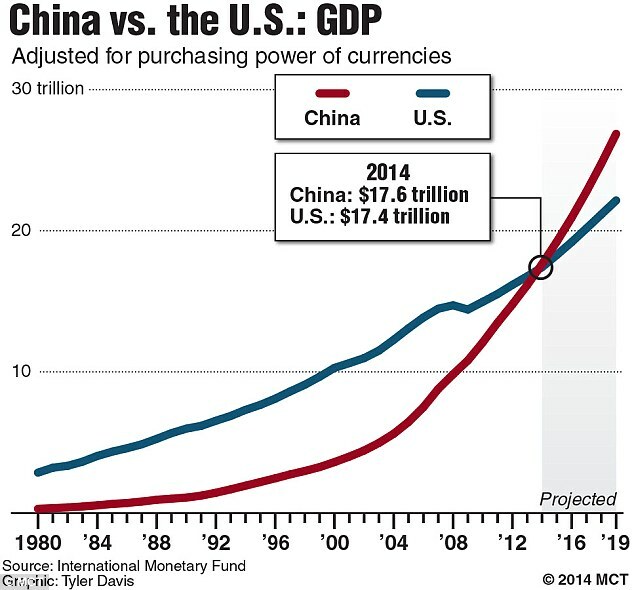 In absolute terms, US economy ($17.4T) is still larger than China's ($10.3T) however, since things are cheaper (for a same basket of goods) in China , when adjusted for PPP, China catapults itself to $17.6T overtaking the US, which has held the lead for the last 142 years. Using the same adjustment, India, Japan and Germany occupy the next 3 spots. We will delve into the details of how this happened in a future article, however, it's important to understand what Gross Domestic Product (GDP) really means. In simple terms, it's an artificial construct that adds up all economic output, everything from nails to toothbrushes, shoes, haircuts, management consultancies, street cleaning, yoga teaching, Investment Baking services and millions of other services and products. As one can imagine, it's an extremely tedious and complex measure. GDP is a fairly new idea. The first national accounts that resemble the modern day ones were produced in the US in 1942. Before that, governments did not bother much about sizing their economies. Until the industrial revolution, most of the world was engaged in agricultural output which barely grew at all. The size of an economy was thus a function of the country's population. In 1820, China and India made up roughly half of global economic activity. Then, as we started industrializing, Britain lead the world in the 18th century, till US overtook the lead in 1872. Simon Kuznets, a Belarusian-American economist often credited with inventing GDP in 1930s, had been asked by the then US president Franklin Roosevelt, to come up with an accurate estimate of the recession in post-crash America. Kuznet's calculation estimated that the US economy had halved in size from 1920 to 1932. Kuznets was meticulous and spent a lot of time thinking of what precisely to measure. He was initially inclined to include only activities he believed contributed to society's well-being. He wasn't too keen on including spending on military armaments and firearms for instance, since they detracted from human welfare. He also wanted to subtract financial and speculative activities (dangerous), advertisements (useless) and government spending (just recycled taxes). He ofcourse lost his battle. The modern national income accounts includes both arm sales and Investment Banking services. They don't distinguish social "goods" like spending on education from socially "bad" ones - say gambling, tobacco sales etc. GDP is thus amoral. It is defined simply as the total monetary value of everything that has been produced in a given period. Other important thing to understand is that GDP is a measure of flow, and not the stock. A country with high GDP might have run down its natural resources and infrastructure to maximise its present income. China has been growing at 10% for 30 years. It makes no allowance for the oil and gas reserves, or the water or forest resources it has depleted over the course of time. GDP also makes no tradeoff between present and future. In theory, Innovation and technological progress should help us find alternatives to these finite resources. Other criticism with the measure is that GDP does a fairly good job at measure quantity, but not quality. It gets exasperated especially while one tries to measure services. How do you compare a brain surgeon in Brazil, a mechanic in Germany and a teacher in India. More than two thirds of any modern economy is Services - Banking, Consulting, teaching, hair cuts, yoga lessons etc. Shouldn't we measure, for instance, the output of a Nurse, by the number of patients she sees, the lives she saves, or the quality of care she provides, opposed to the current method of using the price of her service (what the market is willing to pay for her service) to measure her contribution to GDP. GDP mostly takes into account things that are bought and sold. What about non-marketed activities? The most obvious is housework. There is no monetary value at all assigned to cooking, child-rearing, cleaning, caring for older and disabled people at home. Most of this work is often done by women in developing societies and are often undervalued and difficult to measure. Here in Japan, where I live, the government ins actively campaigning to get more women to work in order to raise GDP. Economists are divided on the real impact to the GDP. Goldman Sachs thinks the impact could be as high as 13% to the GDP. However, If we conduct a simple thought-experiment where overnight, we ask all nominally unemployed women to work in their neighbor's household performing similar housework, but at an hourly wage. GDP of Japan will increase overnight, but in terms of actual work performed, nothing would have changed. The only difference would be that grandpa would wonder why a stranger is looking after him, and the government would have found itself a new source of taxable income. By now, you would have realized how complex GDP as a single measure. And how the pursuit of growing this measure bigger and bigger might not be worthy goal in its own right. Yet GDP has become such a powerful proxy to measure economic success. But do we have any alternatives? I personally find OECD's Better Life Index quite fascinating. It allows users to compare performances of countries according to 11 criteria. So if Community, Education, Health and Safety are most important for you, Denmark, Norway and Sweden should be your picks, whereas if Income and housing are all what you need, you are better of staying in the states. Such a 'dashboard approach' allows voters to decide what they value the most and influence policy makers towards their goals. However, In practice, the combination of multiple criteria measured according to multiple yardsticks renders the exercise subjective and fuzzy. GDP may be anachronistic and misleading. It may fail entirely to capture the complex trade-offs between present and future, work and leisure, “good” growth and “bad” growth. Its great virtue, however, remains that it is a single, concrete number. And for the time being, we may be stuck with it.